Playgrounds.net Blog: How to Select Wooden Swing Set for your Backyard? Installing a wooden swing set in your backyard is the best thing you can do for your kids. While looking for a wooden swing set for your backyard, you should keep certain things in mind. Wooden play sets for kids are available in two styles, which are flat base and A frame base. Choose the play set after considering the slope of your backyard so that it can firmly stand on the ground. Another aspect that you should look for in play set structure is its size. Buy the one that would not cover all the space area of your backyard. Ensure that the wooden swing set you are opting for is made up of high grade raw materials and comply with the quality and safety standards. You should also lay emphasis on the wood quality. The common woods that are used for designing playsets for kids are redwood, treated pine and cedar. With the fact that redwood and cedar are stronger and more stable than treated pine, parents prefer installing the playset made up of the former. You should also check that all hinges and bars on the wooden play set are sturdy and swings are connected to the playset with heavy chains instead of ropes. Also, ensure that the playset has hand rails on both sides of the stairs and ladders that negate the risk of injury. 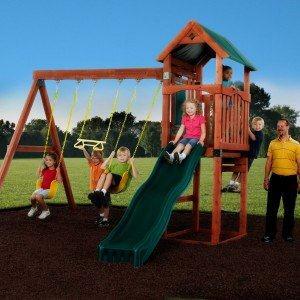 For superior quality wooden playset, you can explore the wide collection of playgrounds.net.